KPM manufacture injectors in a range of sizes; 550cc, 1000cc, 1500cc, 1700cc and 2000cc. Suitable for a number of vehicles including; Subaru WRX/STI, Mitsubishi Evo, Falcon, Commodore, Mustang and many more. The injectors are precision manufactured at KPM Fuel Systems lab, flow tested, and provided with full data sheets to ensure perfect reliability when tuning the vehicle. 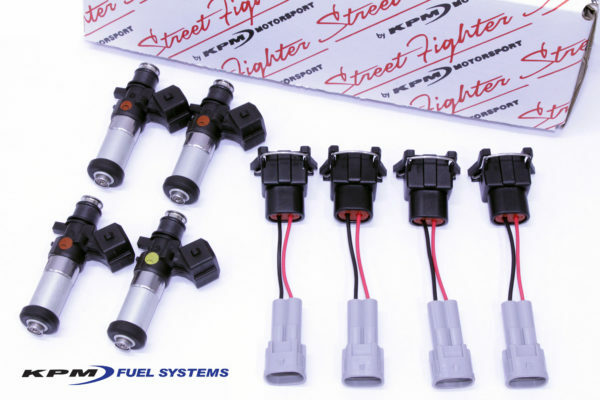 To take the guesswork and hassle out of purchasing the correct injectors and components, KPM have a full-time, fuel system engineer who hand picks each kit. This includes selecting the correct injectors for the customer’s application, the required adaptors and plugs, and generating the injector tuning data. KPM fuel injectors are competitively priced, and are generally available for next day delivery to metropolitan areas. KPM Fuel Systems products are locally developed, manufactured, and readily available for express postage Australia wide. As well as being locally manufactured, the team at KPM Fuel Systems are on-call, ready to help with any technical enquiries. Trade enquiries are welcome, contact us directly for more details: 08 8299 9998.